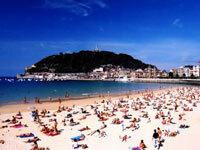 The Basque region's most popular beach, La Concha, is to be found in the genteel resort city of San Sebastian, 62 miles (100km) east of Bilbao. The town became fashionable as a summer getaway during the reign of Queen Isabel when she took to holidaying there in 1845. Today the town hums with boutiques, surf-shops and nightclubs, but the elaborate boardwalk and grandiose historic mansions lend an air of sophistication, as is appropriate for a resort endorsed by bygone royalty. For a spectacular view of the sea and countryside, ride the funicular to the top of Monte Igueldo, or opt for the opposite side of the bay where it is possible to stroll through shady woods to the summit of Monte Urgull, topped with a statue of Jesus blessing the city. The town's Museo de San Telmo, housed in a Dominican monastery, displays some interesting prehistoric Basque artefacts, and a few dinosaur skeletons. The house where Victor Hugo once lived is in the nearby charming fishing village of Pasajes de San Juan, which can be reached by ferry from San Sebastian. The main attraction, however, is definitely the lovely beach, which is wide, spacious and sandy. Various boat tours can be arranged from the pier.